So in the same style as the Recipes: No Chat Page, this is a consolidation of the Baking bits of the Blog which, of course, I wish to give reverential treatment. 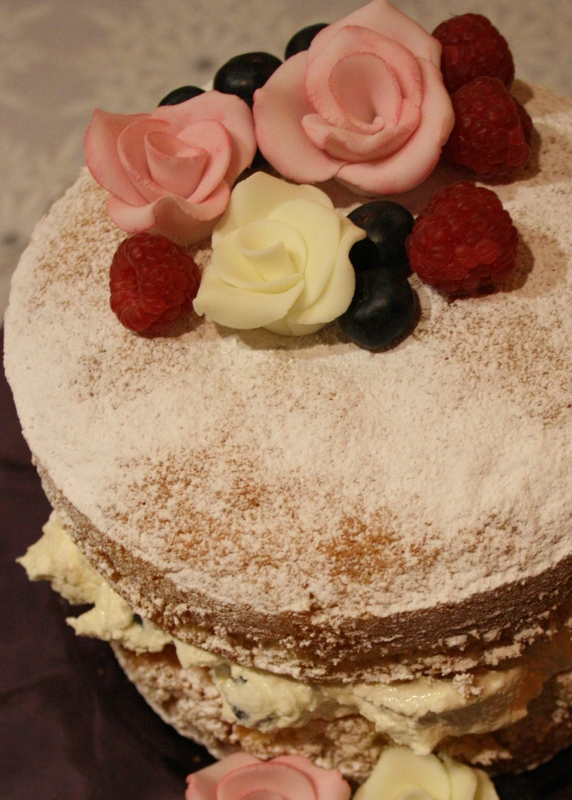 Blogging is offering an outlet to the endless swirl of thoughts about cooking, baking, cakes and decorating and a forum hopefully to offer any know-how I may possess. Therefore, please comment with your experiences and advice too as the sharing of information is the soul of the blog for me. I will put all my cake recipes here and all the tips and advice I can muster. Again, when I have learnt to sub-categorise I shall split the information out into intuitive chunks. Until then…..
As there may be copyright issues if I were to reproduce it, the recipe for these delicious creations is here at the Good to Know website. I have noticed a lot of people ‘googling’ the Baby in Pram cake so I have decided to add a few details on construction. The recipe comes from Debbie Brown’s 50 Easy Party Cakes and consequently as this book is in print I can’t reproduce the recipe in full. However to achieve the pram shape I can say that you will need a 2 litre Pyrex bowl to bake the cake in and need to make a 5 egg madeira. This means 315g each of self-raising flour, butter or margarine and caster sugar, plus an additional 155g of plain flour and the flavouring of your choice. Bake at 160°C/150°C Fan for 1¾hours or so. 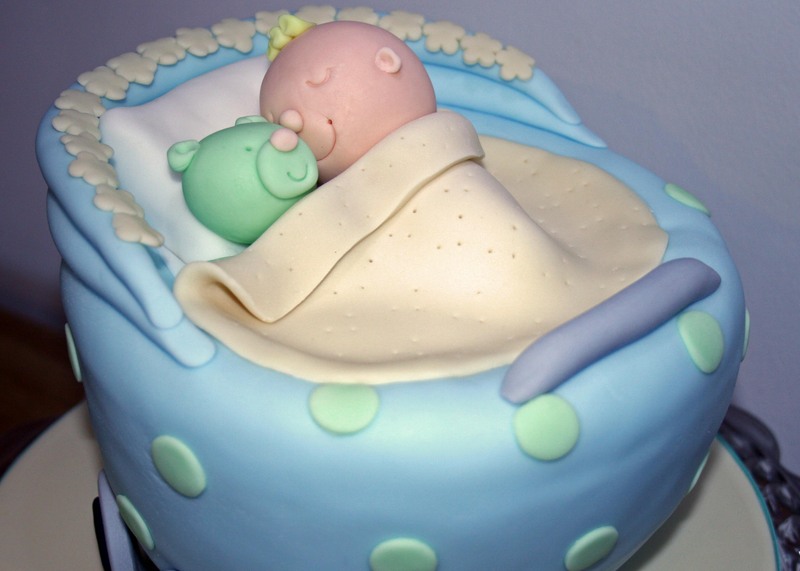 The cake should be coated in buttercream and covered with coloured sugarpaste having first attached a sausage of sugarpaste around the top of the pram to create a rim which the sugarpaste cover will coat too. Wheels of the pram can be made using sugarpaste rolled out thickly and then cut out using a circle cutter of appropriate size. These wheels should be made early on to provide drying time. The Pram hood, pillow, sheet, baby head, teddy head and blanket can then all be modelled. I wouldn’t say this is easy exactly, but if you have some cake modelling know-how these scant instructions should be enough. 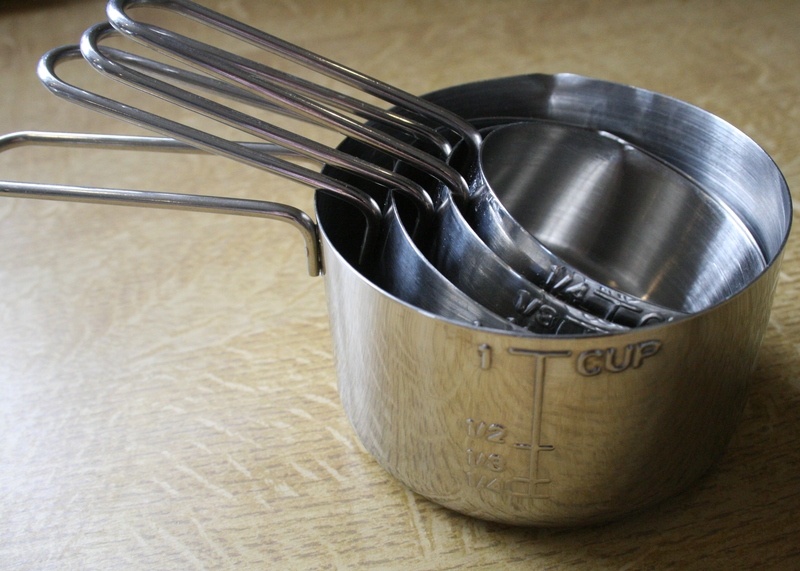 for the purists, and I know at least one, get some American measuring cups, if you are European, and try to only use American recipes or at least those which list American measures. On that final point, there are a myriad of muffin recipe suggestions out there and the cups system is a fantastically simple idea. These are American confections and require the American touch. A set of cups is cheap to buy from Amazon (Tala Measuring Cups) and are creeping into UK recipes more and more. As I am writing up the various recipes floating round my kitchen I realise that I am integrating cup measures into a lot of my day-to-day cooking as they are far simpler to use and more ready-at-hand than searching for measuring jugs and tare-ing the scales. Basically I use them if I can get away with it. As far as I can see the only down side is if one tries to toggle between cups and grams without a thought to the ingredient concerned. A cup of plain flour, for example, is taken as 140g as long as it is not too densely packed in the cup whereas a cup of sugar weighs 200g! For baking recipes therefore I would check online if you need to convert for any reason which is partly why I suggest muffin recipes remaining in cups is a good thing. Therefore possession of a set of cups guards against measuring mishaps. Preheat the oven to 175ºC /Fan 155-160ºC. Combine the flour, sugar, salt and baking powder in a large bowl. Make a well in the centre and add the eggs, oil, milk, butter, lemon juice, golden syrup and lemon extract. Catch the yolks with a tine of a fork to ‘pop’ them and then combine (with the fork) with no more than 10 single stirs. Add the poppy seeds and carry on with a maximum of 10 more stirs. You want a gloopy barely combined, this all looks very unpromising mixture, not all the flour needs to look blended I have discovered. 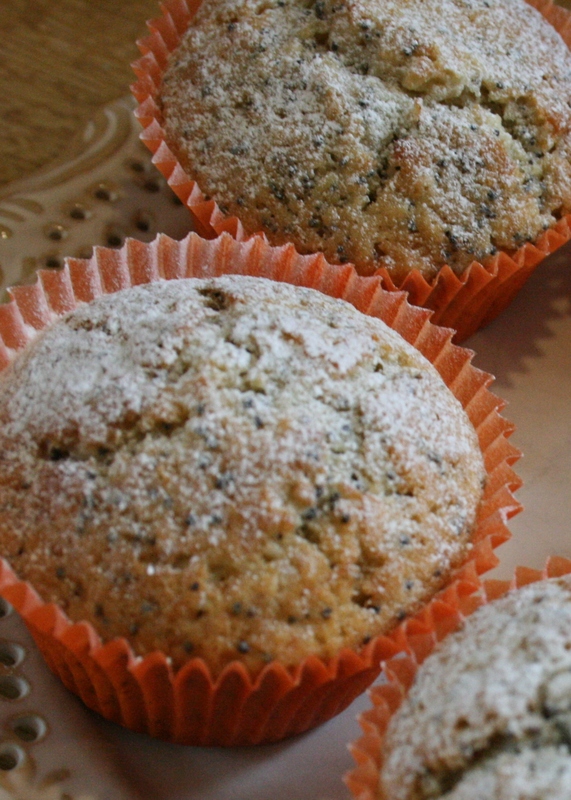 Dollop into a 12-hole muffin tin, with or without cases, but oil the tin if without. Bake for 25 minutes. Remove to a cooling rack and when cold dust with icing sugar. All muffins, sweet or savory, freeze well I have discovered. 4 sheets of Filo Pastry, 200g shelled Pistachio Nuts, roughly chopped, 60g Butter, 150ml water, 250g Sugar, ½ tsp Rose-Water, ½ tsp Orange Flower Water (optional), squeeze of Lemon Juice and a 23cm/9″ square roasting/brownie tin. An hour or so before making the Baklava, make the syrup: put the sugar, water and a squeeze of lemon juice into a saucepan, bring to the boil and boil for 5 minutes. Remove from the heat, add the rosewater and orange flower water if using and cool in a jug. Pour the nuts into a minichopper and whizz up so you have a mixture of finely through to roughly chopped (or you could chop by hand). Melt the butter and brush the roasting tin with butter using a pastry brush. Unroll the filo pastry sheets which will be rectangular and cut them in half, if you are using Jus Rol the sheets cut in half should line the tin perfectly. So, lay a half in the tin, brush with butter, lay the other half and brush with butter again, repeat twice more so that’s 4 layers all together. Pour the chopped nuts over and spread evenly over the pastry, and continue with the remaining 4 layers of pastry and butter from 2 more sheets. You can cut the pastry into triangles at this point, but I did it once cooked. Bake for 20-25 minutes or so, golden brown pastry is what we are after. As soon as it’s out of the oven pour over half the syrup, let it soak in for a few minutes and pour over the rest. Although you may decide you don’t need it all. This perhaps isn’t as easy peasy as some might hope for but should, if all the advice is followed, provide a foolproof solution to baking sponge cakes. I was reminded by my Mother a couple of weeks ago that my Grandmother’s advice when making a sponge cake was to ‘weigh the eggs and take it from there’. This assumes one understands what ‘take it from there’ would mean. I shall explain for anyone who may need to know or has forgotten. As recounted in the Easy Peasy Sponge cake post the weight of the eggs can govern the amount of butter, sugar and flour required to give a light, well risen sponge. I was tipped off by a friend of mine, that hens lay smaller eggs these days thus her Auntie always adds an extra egg to cake recipes. I’m inferring from all this therefore that the ratio of eggs to other ingredients is critical to a successful bake. The other Golden Rule would be to have all your ingredients at room temperature. Cake making consequently requires a little ‘thinking ahead’ but surely this all sounds very promising? For an 8″ sandwich cake: 4 large or 5 medium eggs, weighed, and then the same amount each of Butter, softened, Caster Sugar and Self Raising Flour and 1tsp Vanilla Extract. Ensure all the ingredients are at room temperature and the flour is sifted. Stork Margarine is an excellent substitute for Butter but again should be used at room temperature. Crack the eggs into a jug and whisk together a little and then start adding to the sugar/butter mixture a little at a time beating well but not quickly between each addition. Alternatively, put everything in the bowl with 2 tsp of baking powder and beat until you have a smooth batter. 2 or 3 tbsp of milk can be added if the batter seems a bit dry. You won’t achieve the same light, airy sponge but it is quicker. Split the mixture between the 2 sandwich pans, and bake for around 30-35 minutes until the sponge springs back when pressed. Leave in tins for 5 mins then remove. Cool on a wire rack. Once cold, the cake can be filled with whipped cream or buttercream with or without fruit added. Practice, like with everything, will help. Sponges don’t take long to make in the grand scheme of things and if you have a total disaster the baked sponge can always be used to make cake pops (see side bar). One of the major frustrations people seem to struggle with when making cakes is the consistency of their buttercream. I never really stopped to think about it much as mine seemed OK until I tried the Hummingbird Bakery method and realised that a couple of minor tweaks can elevate your frosting to a delicious, light, sticky delight. Quantities here will fill an 8″ cake and possibly the top too, but as everyone has their own ideas on how much is enough just remember the ratio 1:3 butter to icing sugar. 80g Butter, softened (room temperature), 240g Icing Sugar, sifted, 2 scant tbsp (25-30mls) Milk, ½ tsp Vanilla Extract. Place the butter into the bowl of a mixer and with the paddle attachment beat for a minute or so. (A hand-held mixer will work just a well). Add the icing sugar and slowly and carefully beat until incorporated with the butter. If using a free-standing mixer cover with a tea towel, if not, just go steady and accept there will be icing sugar all over the place. Once you have reached a lumpy, largely combined state, add the milk and vanilla extract, mix on a low speed until all that is incorporated. Then, turn the mixer up to a high speed and beat for 5 minutes. Yes you heard me right. If you are not beating with a hand-held mixer, walk away and wipe down the surfaces covered with sprinkles of icing sugar. Put the timer on. This beating time is critical and makes all the difference! Different flavours need slightly different treatments I am discovering, so I shall drip feed these out as we go along. Add fruit to create interest for now or ¼-½ teaspoon of essences like vanilla as above or lemon, orange, almond, rose-water, coffee that sort of thing. Chocolate is trickier so I shall come onto that soon. So the key here is a reasonable amount of milk and a lovely long beating time. So here’s the link again bbcgoodfood.com for the most foolproof scone recipe. Do exactly as she says, lemon juice in the warm milk and a hot baking tray. All these little things add up with baking. Oh and the absolute golden rule, pat out the dough, don’t be tempted to use a rolling-pin under any circumstances. Salted Caramel – 125g Caster Sugar, 2 tbsp water, 80ml Double Cream, 25g Salted Butter, ¼ tsp Coarse Sea Salt. 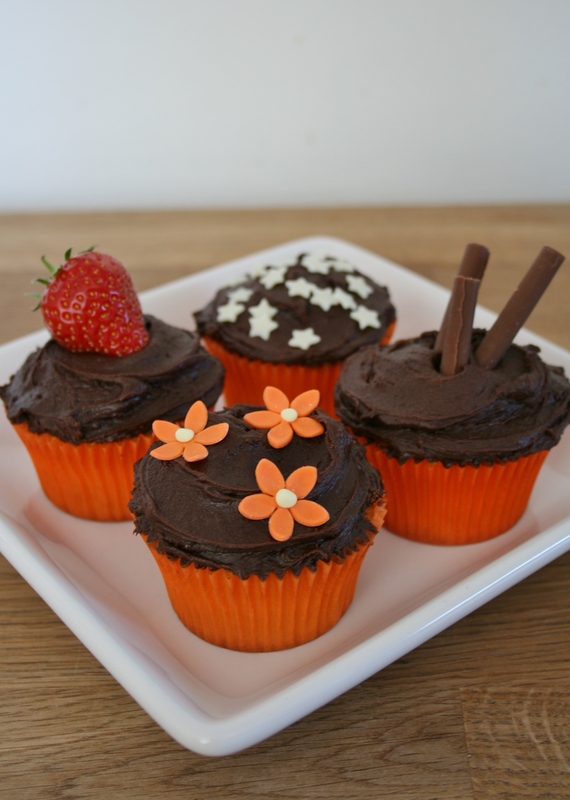 Chocolate cupcakes – 2 large Eggs, 150ml pot Plain Yoghurt, 15ml Double Cream, 85ml flavourless Oil, ½ tsp Vanilla Extract, 175g Plain Flour, 250g Caster Sugar, 65g Cocoa Powder, 1 tsp Baking Powder, 1 tsp Bicarbonate of Soda, ½ tsp Sea Salt, 85ml decaffeinated Coffee, warm. Salted caramel – Put the sugar and water in a small saucepan and heat gently over a moderate to low heat to dissolve the sugar. Do not stir at all at any stage. Swirl the mixture around from time to time off the heat, but once dissolved allow the sugar syrup to come up to the boil and boil for around 5 minutes. During this time the syrup will become a dark ‘caramel’ colour and thicken. Swirl occasionally but that’s all. Once the desired colour has been reached, remove from the heat and very gently and slowly pour in the cream. At this point it will look like it has all gone wrong, don’t panic, add the butter and sea salt too, find a whisk appropriate for your saucepan, and whisk gently until a smooth sauce-like consistency is reached and all the butter has melted. Pour into a jug to cool. After about 2-3 hours the caramel will have arrived at the consistency of Golden Syrup which is the end point. Preheat the oven to 170°C/Fan 155°C. Line a 12 and a 6 hole muffin tin with muffin cases. Put the eggs, yoghurt, cream, oil and vanilla extract in a bowl and beat to combine, use a hand-held or free-standing mixer. In another bowl combine the flour, caster sugar, cocoa powder, baking powder, bicarbonate of soda and sea salt and stir round to mix, then with the mixer on a low-speed start to add spoonfuls of the dry ingredients to the wet. Once all combined turn up the mixer to medium and beat for a minute to form a smooth batter. Once cooked the sponge should spring back slightly when pressed, leave in the tins for a few minutes and then cool on a wire rack. 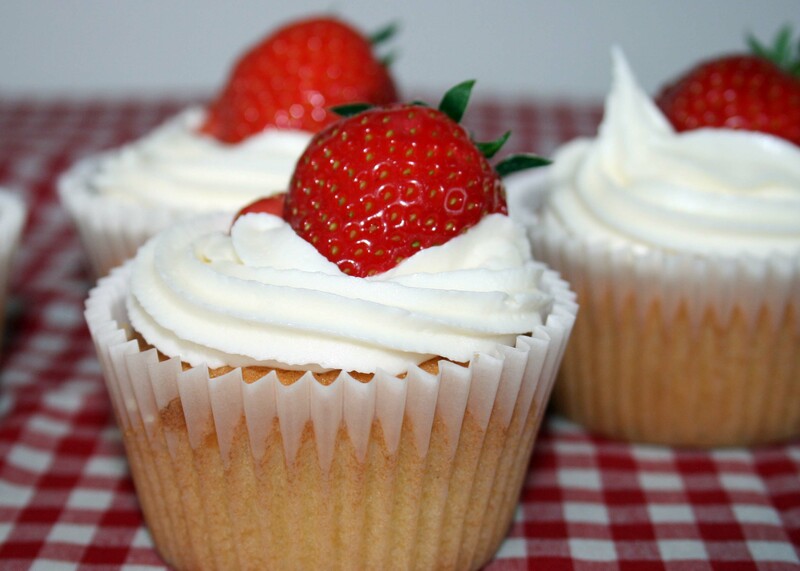 Buttercream – place the butter in a bowl and beat for a minute or so, add the icing sugar and slowly beat with the butter to combine, add 2 tbsps of milk and continue beating slowly until incorporated then turn up the speed and beat quickly for 2 minutes. Turn off the mixer add the caramel sauce and continue to beat quickly for another 3-5 minutes until light and fluffy. Assembly– Remove a plug of cake from the centre of each one with a small sharp knife and drop a small amount of caramel into the hole, then coat with the buttercream however you wish. If you spread it on these quantities will be sufficient, if you want to swirl it on with a nozzle you will need to make more. Decorate by drizzling caramel across the top of the buttercream or pipe a puddle of caramel into a small well scooped out of it. Alternatively chocolate sprinkles or mini fudge chunks, that sort of thing, can be used. The original recipe is as follows and fills and covers a 7″ sandwich cake: 75g Icing Sugar, 25g Cocoa Powder, 40g Butter, 50g Caster Sugar, 2 tbsp Water. Sift together the icing sugar and cocoa powder into a bowl. Into a non-stick saucepan add the butter, caster sugar and water and heat gently until the butter melts and the sugar is dissolved. Stir to combine and then pour over the icing sugar, cocoa powder mixture. Mix well preferably with a balloon whisk to achieve a rich, thick, glossy mixture. Leave to cool which will take around 30-40 mins until a spreading consistency is reached. 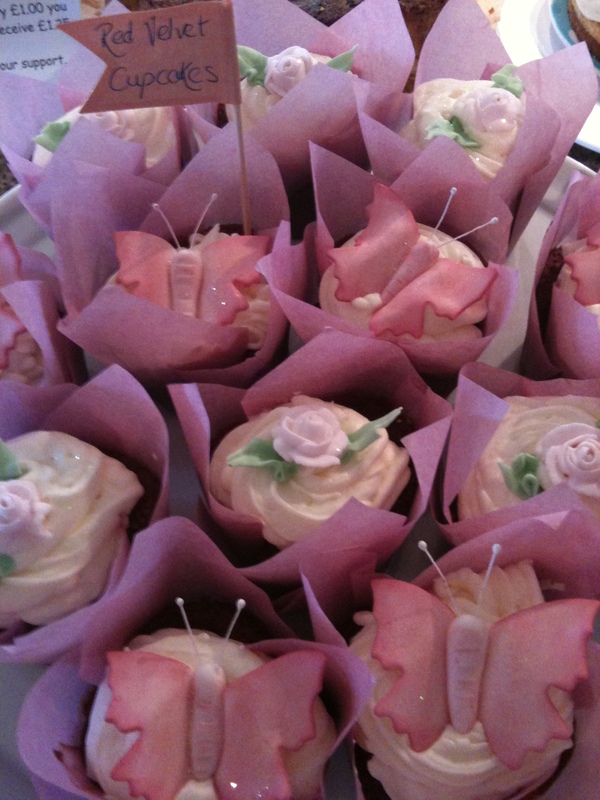 Coat the cupcakes with the icing in batches of 5 decorating as you go. If you decorate once all the cupcakes are coated the icing will have dried out and the decorations will not stick properly. I love to make my own decorations for cupcakes as you can achieve the colour scheme you require more easily and adapt for gender, occasion and all the rest of it. Fresh fruit and sprinkles to be honest can get you a long way, but as you can see from my website there is also alot of scope with homemade designs. 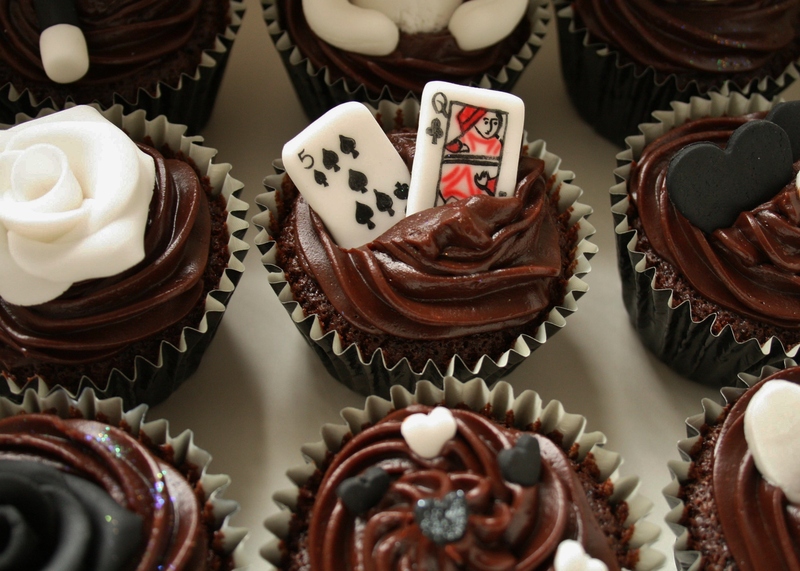 You will need: a small rolling pin (smooth wood or ideally polypropylene), a small palette knife or small, flat, sharp knife, some sugarpaste in whichever colours you require, icing sugar or Trex, cutters. Take golf ball sized pieces of sugarpaste and roll out on the worksurface lubricated with either icing sugar which has been sprinkled on or Trex which has been smeared over the surface. Dust or coat the rolling pin too, much as you would if you are making pastry. Roll the sugarpaste into a strip, check it is loose from the worksurface by sliding the knife along the worksurface underneath the sugarpaste. Then cut out with cutters or using a small sharp knife into the required shapes. Transfer your shapes with the knife onto a piece of greaseproof paper on a plate or tray. Leave to dry overnight. 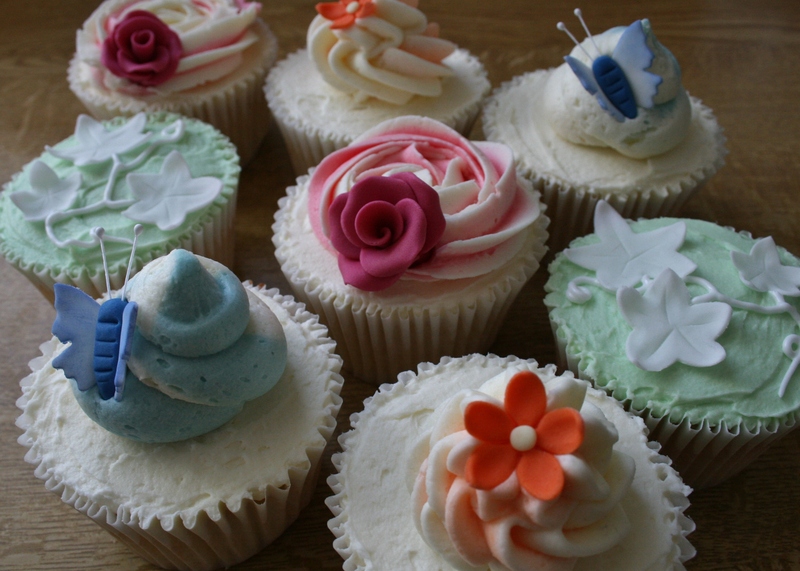 Cutters can be obtained on-line, from specialist cake shops and from craft shops. Plastic ones will only need a wash to make them suitable for food use, but the metal ones should be used only for food if designed for that purpose. Metal or plastic they come in a variety of shapes, blossom, flower, butterfly, stars, leaves, hearts, novelty shapes, letters, the list goes on. If the paste sticks to the cutter then use the end of a paint brush or cocktail stick to gently push the shape out from the edges. Move your shapes around with the palette or sharp knife as they are very easy to push out of shape until hard. 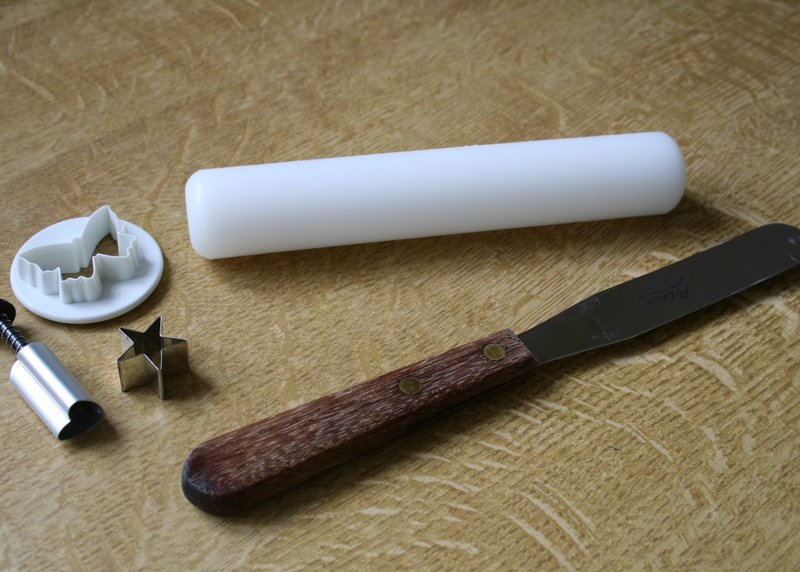 Small rolling pins and palette knives are essential pieces of equipment if you wish to make a lot of cake decorations and can be purchased at very reasonable prices on-line. The Craft Company (a favourite of mine) have a good selection. Best served warm with icing sugar sprinkled over.